"There are two forms of red mange in dogs; localized and generalized. Treatment usually consists of a miticide to kill any mites and topical or oral medication to address any bacterial skin infections. For localized mange (less than 5 hairless skin patches), usually no treatment is needed and will heal in 2 months. 10% of dogs go on to develop a more generalized form of mange which spreads over the body. For this group, treatment is needed. For generalized mange, with is seen in 5 more more locations, visit a veterinarian for a prescription antibiotic and a miticide. It will also be helpful to keep the skin clean with a Benzoyl Peroxide based shampoo. A veterinarian will also look for an underlying cause that compromised the immune system, enabling the mites to colonize. The length of treatment depends on the extent of the infection." This is primarily seen in dogs that are less than 1 year old. The disease is confused with ringworm since they have a similar appearance. Most cases cause the appearance of hairless patches on the dog's face. 90% of cases in puppies heal on their own with no treatment. Approximately 10% of localized demodectic mange cases spread over the dog's body, becoming generalized cases. No treatment is needed in 90% of cases. To speed healing an ointment made for treating demodectic mange such as Goodwinol Ointment may be of help and the use of a skin cleanser that contains Benzoyl Peroxide such as CuraBenz. Don't be concerned if rubbing ointment into the skin worsens the appearance from rubbing or by breaking nearby hair. A topical antibiotic may be needed to treat any signs of infection . If you don't see improvement within 1 month see a Veterinarian. Length of treatment: 1 month to see results (with ointment or no treatment), 3 months for total cure. Mange that is generalized is present with there are 5 or more spots. Hair loss usually occurs all over the body, including the head, legs and body. Generalized mange is an inherited condition, with a prohibition against breeding any dog that has suffered from the disorder. If the skin itches or has a bad odor, it indicates the presence of infection. Adult dogs with demodectic mange are usually suffering from some type of underlying condition which is depressing the immune system. A veterinarian should be consulted who can check the dog for hormone problems, cancer or some type of kidney or liver disease. Amitraz Baths: Applied for 7 to 14 days in a concentration of .025% to .05%. Dilute in warm water in a low concentration to reduce any toxicity risk. Ivermectin: This medication is not registered for Red Mange but is widely used. It is given to the dog orally (400-600 mcg/kg/day). Treatment lasts for 14 days. Note that herding breeds such as Collies have a sensitivity to Ivermectin eliminating the use of this medication. There is an Ivermectin sensitivity test available or a Veterinarian might test a low dose before using at the recommended dose. An alternative for Collies is the medication Promeris, which is a combination of metaflumazone and amitraz. Promeris has shown mixed results, only being effective in some dogs. Milbemycin Oxime: This type of red mange treatment is considered to be safer than Ivermectin and is given orally. It is provided at .5-2 mg/kg/day. It needs to be taken with fatty food. One drawback of this approach is cost. The dose varies from 1 mg/kg/day and then 3mg/kg 1x a week to accelerate healing. Moxidectin: This is a product used in livestock and is not registered fo ruse in dogs. It is given at 400 mcg/kg/day. In terms of an antibiotic, medications of choice include cephalosporins and amoxicillin-clavulanate. The secondary method for treating demodectic red mange is using a prescription dip such as Mitaban (active ingredient in Amitraz). Owners looking for an over the counter demodectic mange home treatment can try an over the counter-lime-sulfur based solution dig such as Naturasil. The product is combined with the dog shampoo you already use and then applied to your pet. The solution is left on your dog for 5 to 7 minutes, followed by a rinse. The product is used very 5 to 7 days, 2x to 3x. Improvement should be seen in days. Be sure to keep the skin clean with a Benzoyl Peroxide shampoo such as CuraBenz. A homeopathic such as Skin and Coat Tonic can be used for added support during recovery. There are also newer spot-on treatments that contain amitraz and moxidectin. Treatment for Younger Dogs: Puppies by their very age have a immune system that hasn't fully developed. A veterinarian will recommend either a prescription or over the counter (Naturasil) treatment method. Ivermecitin and dips may only control demodectic red mange. Dogs should be tested for mites every two weeks to determine when product use can be stopped or reduced. Dogs that relapse tend to have ended treatment too early. If relapse does occur, it is usually within 6 to 12 months after treatment has stopped. Mites located at the bottoms of the feet and paws are particularly difficult to treat. Often this is the last area of the body affected by mane while a dog is recovering. This form of mange affects dog paws. 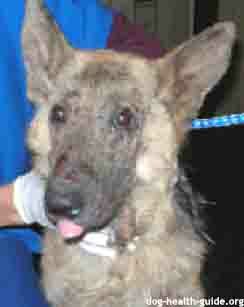 The condition results in mange and skin infection. There is a higher incidence in the Shar pei and Sheepdog. This type of demodectic mange treatment on dog paws is the same as other forms of demodectic mange. Naturasil: Naturasil is a natural lime-sulfur product that is added to your dog's shampoo. The lime-sulfur acts as a miticide. CuraBenz Shampoo: Use a Benzoyl Peroxide based shampoo to keep the hair follicles clean. If the condition worsens, spreads to other parts of the body, is accompanied by other symptoms, or is not eliminated in 2 months, then visit a veterinarian. The mite that causes demodectic mange does not spread to people. Even if the mange mites no longer live on your pet, they could be alive in the rooms where your dog lives. To avoid a reoccurence of the canine mange problem, it's important to use a miticide in your home designed to kill mites. We recommend Benzarid since it is both safe and highly effective when used indoors. They also sell a power steamer for remove and kill mange mites from patio or outdoor areas. Be sure to wash your dogs belongings in a good detergent as well.